He did not come with storm and tempest, he came with a small leather suitcase. He paid the ferryman in cash, muttering a combination of thanks and apologies that the English seem to think necessary for such transactions, and then set off up the beach. He walked with a stick, a simple length of hawthorn with a V at the top, but he put no weight on it. Even when he stumbled on a rock, or slipped on the seaweed, the stick was a balance more than a rest. By the time he had reached the saltmarsh his woollen overcoat was glistening with droplets of water, and his scarf hung limp. He wore no hat, and his untidy red hair was plastered to his head with the fine cold rain. He paused to take in his surroundings. It’s strange how the mind plays tricks on people. The Englishman knew he was many hundreds of miles away from home, but his eyes were tracing familiar landmarks in the sparse vegetation and rocky outcrops. “Just like Begger’s Lane back home”, he thought to himself. It was certainly true that the Hopeless landscape around him seemed remarkably similar to the abandoned staithes and marshes of the Fens where he had grown up. Finally, the Englishman appeared to reach some sort of decision of the “this will do” variety and put down his case. Opening it, he revealed the sparse contents within, begging the question in the mind of the casual observer of why he bothered with a case at all. Had the Englishman written an inventory of the contents, it would have listed just three items; a jar marked salt, a candle and a box of matches. The Englishman took the jar marked salt and used its contents to trace a circle in the tussocky grass. Then he used the matches to light his single candle. And, with his staff in one hand and candle in the other he stood and waited. “I can smell your fear.” Came a soft voice from behind him. “I just want to ask a question…” the Englishman began. “A dangerous question that I refuse to answer!” snapped the vampire. He was stood in front of the Englishman now. Tall, pale (naturally) his white hair was long, as were his fingernails. He wore a morning suit, old but well-tailored and immaculately turned out. The vampire took a long stride towards the Englishman. “Did you think a circle of salt would keep me out?” he asked with a sneer. “No” replied the Englishman, drawing himself up and casting off his shivers and muttering tone. “The circle is to keep you in, and it’s not salt.” With that he cast the lighted candle to one side, and where it fell a flame sprung from the ground, spreading quickly until it had encircled the two adversaries with a tall sheet of red and yellow flame. “You challenge me?” asked the vampire, his voice rising a little in his surprise. “I knew you would not give me my answer willingly, but if I can beat you then you will be compelled to give me my bearing.” The Englishman said, raising his voice of the noises that were emerging from the marsh around them. The vampire was summoning up support. Vampires and deamons could not cross into the circle of fire, but their rituals and spells could. “You will lose and I will claim you.” the vampire hissed. “Then that is our wager.” the Englishman called back. The noises around him were no longer indistinct, but definite chanting. The Englishman closed his eyes in concentration and began to recall the old words of the marshlands. Needing something to focus power upon, the vampire began taking items from his pockets; piece of broken china, an old coin, a dog hair brush. With each item he uttered a single syllable and the darkness around him grew deeper. The Englishman could feel the chill of the darkness begin to bite him. This would be close run thing. But first he must drive off the vampires allies. “Fire and Water, Land and Sea.” He called, and as he did so there was movement in the mist around his legs. “The horn is sounded, the drum is beat. Clay’s light shines on the marsh, carried by the wind.” The Englishman whistled through his teeth, a long forlorn note like a lonesome bird calling over the sea. Lights began to jump from the marsh outside the circle. The Englishman whistled again. “Whistle and they will come!” he called. The lights came toward the circle, scattering the deamons and vampires as they moved. 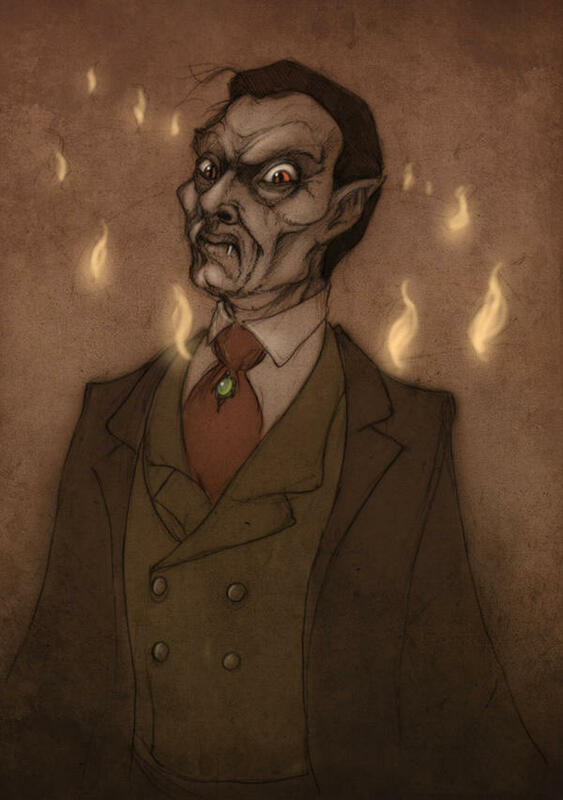 A roar of hooves suddenly split the air and passed through both Englishman and vampire, though the circle of flame did not waver for a moment. As suddenly as it came, it went. Leaving only silence. The vampire would have to fight alone. But the vampire was old, cunning and powerful. Even as the first jack o’lanterns flickered into light, he had changed his chant and charms. Long fingers passed tokens and tools from hand to hand, some seeming to hang in the air until needed. Again the darkness thickened, and the cold bit and stung. The Englishman knew that his last effort had come and that this would be the making or breaking of him. He gripped his staff tightly before him, both hand locked together. He thought of his lands and his people; the men from the water, the men from the marsh, the dark eyed travelling folk who had raised him. The woods spilt out of his mouth like blood from a wound. 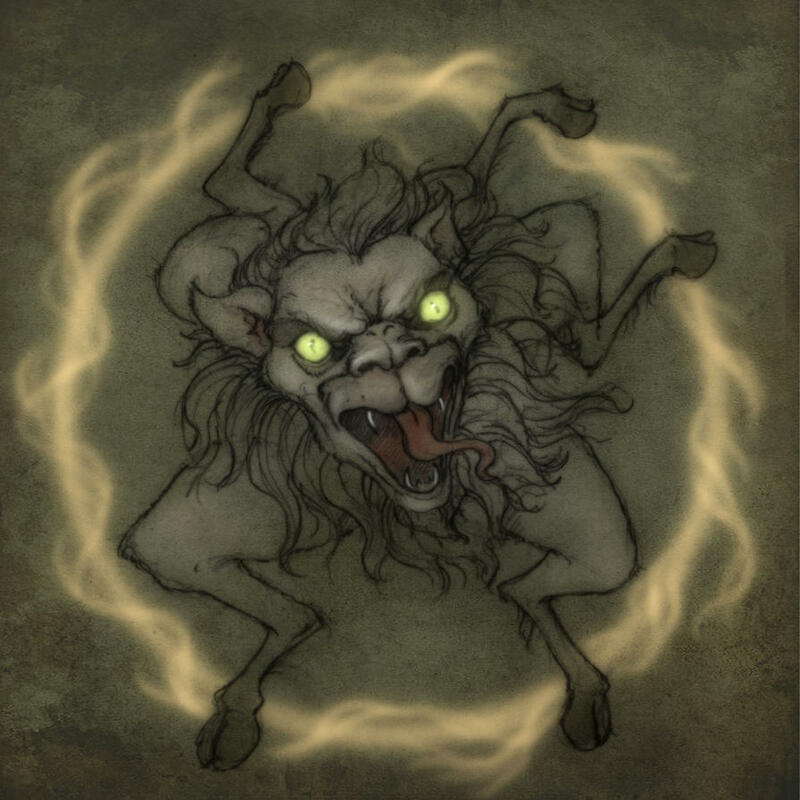 As he spoke, luminous mist appeared to rise form the ground around his feet, spiraling around him. His staff glowed hot and he, himself, began to radiate light. The thunderclap split the twilight. The mist and drizzle scattered. The circle of flame shrank and died. “Cast your staff down and it will point your way, coldblood!” came the vampire’s voice. As he spoke he rose from the ground like a mist, a short distance in front of the Englishman. “Coldblood?” the Englishman asked in horror? The Englishman looked at his hands and as he watched the colour drained from his fingers. “But I won!” he shouted. And with that he sank and faded away. The Englishman threw down his staff in anger. It spun and then came to a rest, pointing his way. Next to it lay a shell, one of the vampires discarded trinkets. The Englishman picked them both up. Joseph frowned. It was unlike Randall Middlestreet, the Night-Soil Man to leave messages, however brief. Wondering what it might mean, the Passamaquoddy trader, yawning and scratching, made his way to the front of the cabin to get a better view of the hills. At first he could see nothing strange, then he noticed it; a thin wisp of blue smoke was curling its way into the foggy air. This was unusual. For Randall to have seen the fire, it must have been burning through the night – and the Gydynaps was not a place for camping. The hills were strange, even by the standards of Hopeless. Someone could be in trouble up there and Joseph, being the man he was, decided it was his duty to investigate. As it happened, others had seen the smoke and had had similar thoughts. Bill Ebley and Solomon Gannicox were standing outside the Squid and Teapot when they spotted Joseph. Bill waved a greeting and the pair waited for their friend to catch up before going on. Joseph was quietly relieved that the others were there. Any expedition on this island – especially into the hills – could be hazardous and there were few men he trusted more than Solomon and Bill. The three walked in silence for much of the time, aware that their every move was being scrutinized. By and large the watchers were invisible, their presence felt rather than seen. 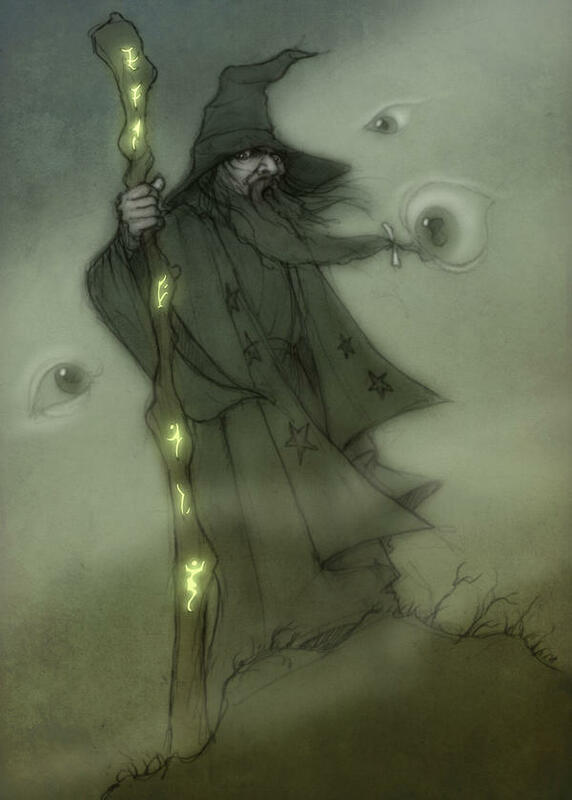 Then there were the ever-present eyes, hovering in the misty morning skies. These, while somewhat disconcerting, were deemed to be harmless. They were a phenomena of Hopeless known to everyone yet rarely mentioned. There seemed to be an unspoken agreement throughout the island that the eyes in the sky were to be ignored, as if by acknowledging their presence it would somehow cause them to be something more than the passive observers that they apparently were. At last the trio reached the summit of the hills without incident. The plume of smoke was thicker here. It reached up from behind a ridge, where, Joseph remembered, there was a small cave hidden in the folds of rock. Warily they made their way towards the smoke. Standing perfectly still and warming himself before a small fire, was a slight figure – a young man – dressed in what appeared to be a long, white nightshirt. Joseph could hardly believe his eyes. Bill Ebley looked at Joseph. 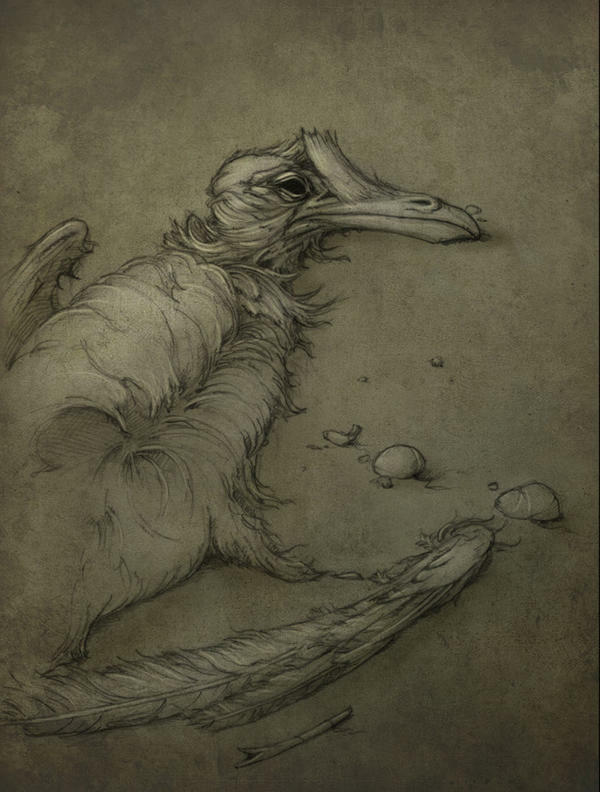 All of the island remembered the Hallowe’en party, when Daniel Rooksmoor had wandered up into the Gydynaps and been taken away by Pamola, the bird-demon. Daniel looked at the three men with some wonder. Bill looked at Solomon and twiddled his index finger next to his right temple, the worldwide sign denoting that someone is not in full receipt of their senses. The distiller gave a small smile and raised his eyebrows in agreement. Daniel saw this mummery and became angry. The boy was not placated. Solomon Gannicox was losing his patience with the boy’s rambling. Joseph made his way towards the boy. He reached to put a reassuring hand on the boy’s shoulder and it was then that something happened that neither of the three islanders would ever speak of again, even among themselves. Daniel Rooksmoor fell to dust before their eyes. In the spring of 1888 Harriet Butterow and her friend, Petunia Middlestreet, perished in the sea while trying to salvage goods from a shipwreck. Their respective daughters, Amelia, aged six and Lilac, aged three, became the wards of Harriet’s father-in-law, Bartholomew Middlestreet, the landlord of the Squid and Teapot. In order to give the girls the best possible education and home life Bartholomew relinquished management of the inn to his long-term tenant, the odious Tobias Thrupp. Ten years slipped by and Bartholomew died. Nothing more was heard of the girls for the next two years, until they were rescued from Thrupp’s clutches by Abraham, a Passamaquoddy trader who took them to his reservation on the mainland. The girls lived happily with Abraham and his family until Lilac fell in love with Abner Badbrook, a silver-tongued rogue. The two eloped in the dead of night, only for Abner to desert Lilac when he learned that he was to become a father. Fearing that she would not be able to support her small son, Lilac left him on the steps of a convent. 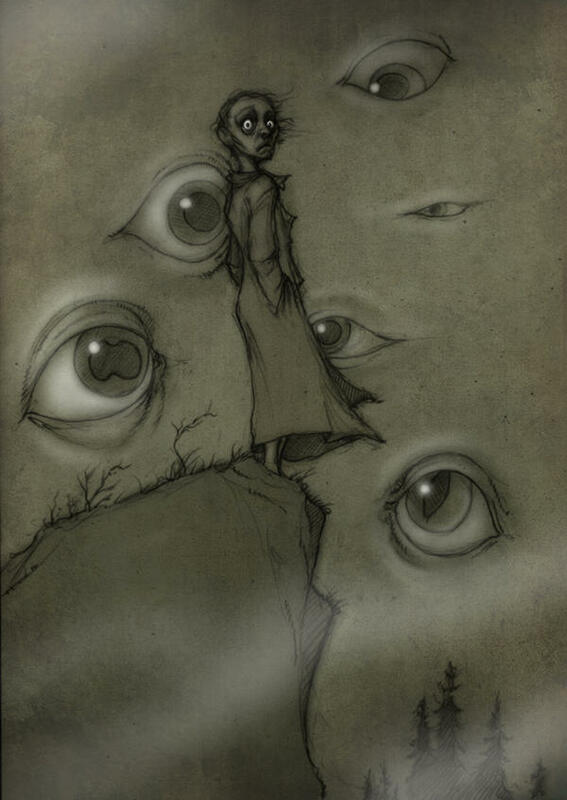 While being taken for adoption to New Brunswick, the child, Randall and his guardian, Sister Mary Selsley, of the Little Sisters of St. Chloe, were shipwrecked on Hopeless, Maine, along with the ship’s captain, Sebastian Lypiatt. Amelia was saddened but not surprised by Lilac’s departure from the reservation. Her friend had been acting strangely for a week or so prior to her disappearance. It had become obvious to Amelia that Lilac was smuggling food and soft deerskin blankets to someone in the forest but she said nothing to Abraham or his wife, Cenopi. Over the following weeks Amelia retreated increasingly into her own thoughts. She took to wandering along the river bank, as though seeking something. In blocking out the rest of the world she seemed to have switched on part of herself that had formerly been sleeping. Amelia had often heard the seals before, of course, going about their business in Passamaquoddy bay. The plaintive barking that was so familiar, however, one day became an invocation, a siren-call to those who could hear its message. Like one in a dream Amelia made her way to the water’s edge, then hesitated. The abiding memory she had of her mother was of being warned never to go into the ocean. After Harriet herself became a victim of the grey Atlantic, Amelia could see the sense in this, not knowing the real reason for her mother’s fears. In truth, whatever her mind had said, a greater force was at work within Amelia and all of the warnings in the world would not have prevented her from being drawn towards the seal-song. There is a point where practicality, driven by instinct will always prevail over the modesty imposed by social mores. That morning Amelia gazed over the expanse of shining water and without a second thought, took off her clothes. She laid each garment carefully on a dry rock, then – for reasons beyond her comprehension – threw herself into the chilly waters of the bay. After the initial shock of hitting the water she began to panic. For a brief moment the old Amelia took control, thrashing and screaming in the swirling current. Then a great calmness swept over her. Dimly she imagined that this must be the end. If this was death it was not so bad. It did not come as some hostile enemy but almost as a gentle guardian, come to gather her into its warm embrace. But she was confused; none of the things she had been led to expect was happening. There was no bright light, no welcoming family waiting with outstretched arms to usher her into the afterlife. What she did feel, however, was warmth and strength and a undeniable desire to eat some fish. Amelia looked down at her body. It was sleek, fat and furry. Instead of arms and legs she had flippers. Then something in her remembered; this was a memory not spun from intellect but from instinct. A memory that flowed in her blood and lived in her bones. She was Selkie. In the event, there was a family to welcome her, after all. The Harbor Seals had sensed that she was near and had been waiting. Amelia had come home. She dimly remembered that she had once had a friend with the same name. An ache grew inside the selkie, suddenly wanting to know more and if her friend was close by. She watched as the little party washed up on to a foggy shore – a somehow familiar foggy shore, she thought – and made their way inland, abandoning the table and rough tarpaulin that had served as a makeshift sail. Amelia dragged herself onto the rocks. As she dried, her skin sloughed off to reveal her human form. She folded the sealskin and hid it in the rocks, then, in the best tradition of Adam and Eve, became suddenly aware and ashamed of her nakedness. The only item to cover her modesty adequately was the old tarpaulin, which she draped about her as best she could and, in bare feet, made her way inland. Amos Gannicox was sitting outside his cabin when he saw her. His face suddenly became a deathly white, as though he had seen a ghost. It must be admitted that seeing ghosts was not that unusual on this island. Amos had seen several in his years there. This particular ghost, however, had a special place in Amos’ heart. “Ha… Harriet. Is that you?” he asked, nervously. “ Pardon?” Despite her selkie years, Amelia had not forgotten her manners. “My mother was Harriet…” said Amelia as memories of her childhood flowed back. It did not take long for Amos and Amelia to piece together the events that had led up to her disappearance from the island. She told him about her time on the reservation and her living with the seals. Amos reddened. Harriet had always claimed that Amelia’s father was a selkie and he had dismissed it out of hand as delusion. The girl’s story now gave the tale some credence. After Harriet’s disappearance Amos had salvaged some of her things as keepsakes. He had been secretly in love with her and could not bear to see her few possessions scavenged by the other islanders. From these he found some suitable shoes and a dress, which was a much tighter fit than Amelia had expected it to be. She could not remember having been quite so rounded when on the reservation. When he was told of the child, Randall Middlestreet, Amos made a few enquiries and soon learned that the boy was in the care of the orphanage. Upon hearing this Amelia immediately resolved to go there herself. It was her plan to volunteer to help, thereby allowing her to keep an eye on Randall’s welfare. Amelia had been there but a few hours before she found an unexpected ally in Sister Mary Selsley. The nun’s calling asked her to accept, without question, many things that, in a secular setting, she would find to be totally implausible. So, to recognise the existence of a shape-shifting selkie did not demand of her a huge leap of faith. Sister Mary had been born and raised on the wild west coast of Ireland where these creatures were known to exist and held in some regard. To those, like herself, who had lived among the selkies, there was something in their eyes and general bearing that betrayed them immediately when in their human form. These things she saw, and loved, in Amelia. Sister Mary had nothing like the same regard for Reverend Malachi Crackstone, the principal of the orphanage. Besides his being a protestant, which was cause enough to meet the nun’s disapproval, she found him to be a mean-minded, unpleasant man, given to cruelty. She warned Amelia not to reveal any of herself to him, although the parson had already discovered that her great grandmother had been Colleen O’Stoat, a woman widely suspected of being a witch. Crackstone made no secret of his instant dislike for the girl, a dislike that forthcoming events would turn into something akin to hatred. The mind and instincts of a seal and those of a human have little in common, outside of a desire for survival. 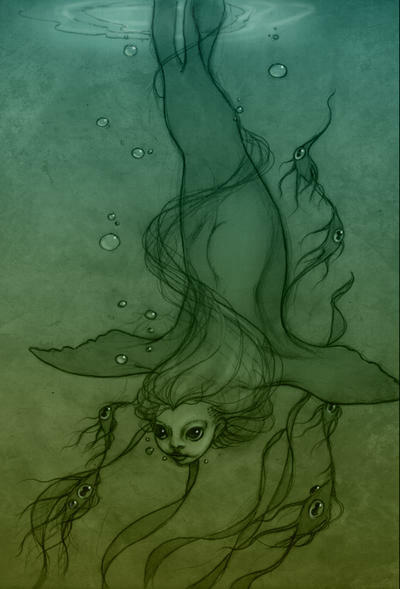 That is why – perhaps mercifully – a selkie woman recalls her seal life as little more than a dream, and vice-versa. So, when the nun pointed out to Amelia that she was decidedly pregnant it came as something of a surprise. It certainly explained a few things but she had no recollection of ever mating. Sister Mary assured her she must have done so; to the nun’s knowledge there had only been one instance of a virgin birth and to suggest this might be another was nothing short of blasphemous. There was another problem. A human gestation period is nine months, while a seal’s is eleven. A massive conflict was raging in Amelia’s body and she was not having a good time. In the event, the strange nature of the pregnancy brought on the onset of labour several weeks early. It was a hard and traumatic birth. For two whole days and nights Amelia was wracked with pain that took a great toll on her strength. In her heart Sister Mary suspected that there would be little chance of Amelia or her child surviving the ordeal. As the clock struck midnight, heralding the vernal equinox of 1905, Betty Butterow was born. As Sister Mary had feared, the fight to bring Betty into the world had been too much for Amelia, who, by now, was pale and very close to death. Crackstone, with a heart as cold as ice, took the child casually from the weeping nun’s arms and swept off to find a wet-nurse. Tearfully, Sister Mary stripped the blood soaked shift from Amelia’s lifeless body and washed her. As I have mentioned before, Sister Mary was no delicate, frail thing. Effortlessly, she lifted Amelia into her arms and carried her out into the night air. Unless you are a Night-Soil Man it can be perilous to walk about the island after dark. Fortune, or something else, was on the nun’s side, however, as she made her way to the precise spot where Amelia had said she had hidden her pelt. A mist-shrouded full moon watched with a baleful eye as the sealskin was wrapped securely around Amelia’s lifeless form. For her own peace of mind Sister Mary said a few suitable words to her God, then, gathering up Amelia’s body, waded into the ocean, almost to chest height, and placed her precious bundle upon its surface. She watched sorrowfully as the dark water folded over the girl and drew her into its inky depths. Making her way back to shore, soaked and shivering with bitter cold, the nun was comforted by the knowledge that she had returned Amelia to her true home. A sudden noise made her turn. Just a few feet behind her a seal’s head burst through the water. For an instant that felt like a lifetime the two regarded each other in the moonlight. A spark of recognition flared in the seal’s dark eyes. The seal lingered a moment longer and the connection that had momentarily flickered between them gradually faded, like a candle being slowly extinguished. Without giving the nun another glance, the seal turned and headed for the open ocean, completely unaware of the identity of the human standing in the water behind her. The selkie that had been Amelia Butterow was now a seal forever, forgetful of the life she had once known and the daughter she left behind on the mysterious island of Hopeless, Maine. Why do we do things we’re not supposed to? The label on the bottle was clear enough; ‘Do not open’. There didn’t seem anything particularly interesting in the bottle, just sand, a couple of small pebbles all topped up with a lot of rather murky water. I shook it and something metallic bounced against the glass. I peered closely at the contents and through the swirling cloud of liquid dirt I could see a spoon. The bowl section was partly buried in the sand, the handle resting against the side of the bottle and then, just for a split second, I saw it. There was something written on the front part of the handle. I squinted, as though that would make any difference. It was no use, the water was just too grim – so, I uncorked the bottle. I could swear I heard a young girl giggle. I looked around, but I was alone on the shingle beach. I looked up; the sunny day had begun to darken as a light rain started to fall. I emptied the contents of the bottle onto the beach as the rain fell harder. I picked up the spoon and washed it in a nearby rock pool. The words etched onto the handle became clear. A chill ran down the back of my neck. I dismissed it as a lucky raindrop. I felt nervous. I don’t know why, I’m not usually a nervous person, but the message on this spoon just spooked me. I dropped the spoon back into the dirt, firmly replaced the cork and threw the bottle as hard as I could into the Atlantic Ocean. A fitful night’s sleep followed. I just couldn’t get that message out of my mind. On the rare occasions when sleep did take over there were visions of forbidding granite cliffs and a dense fog muting every colour. I awoke early the next morning with a sense of doom enveloping me. I walked back down to the sea front to try and clear my head. The clouds had become darker and the rain was descending in vertical sheets as the waves swarmed around my boots. A dull clunking sound made me look down; it was the same bottle I had picked up yesterday. Again I heard laughter, but this time something else – the sound of someone sobbing. It was only the faint, ghost of a sound, but I know I heard it. The crunching of footsteps on the shingle made me look around to see who I shared the beach with. No-one. I was completely alone. “You shouldn’t have done that,” a girl’s voice giggled. I twisted around to see a thick fog rolling in from the ocean. But fog doesn’t talk, does it? There was definitely no-one else around. The message on the spoon must have spooked me more than I realised. The fog swarmed everywhere and within minutes I could hardly see my own feet. The laughing got louder. “It won’t be long now,” the voice giggled. “Who’s there? Show yourself,” as if I could see anything in this pea-souper. I tried walking towards the voice, but I was effectively blind. I stumbled forwards, my hands bracing my fall onto the sand. This is a shingle beach, there isn’t any sand for miles in either direction. My hands dug in and clenched into fists. It was definitely sand. That wasn’t the only thing that had changed, the sea had got louder. No longer the gentle lapping motion of water on the pebbles, but now the giant crashing of waves against rocks. There are no rocks for miles. No rocks and no sand. I rubbed my hands together and could feel the sand smoothing down my skin. The freezing rain ran off my hair and dripped onto the sleeves of my coat. How can the rain be so cold? This is the middle of July. I looked up and thought I could see the fog thinning out. “Almost there now,” the giggling voice seemed to mock me. “Let him go,” a second voice moaned. As the fog thinned into a mist I could see two young girls standing in front of me. One, slightly taller, had a mischievous smile on her face, the other tears trickled down her cheeks; both had a wan, jaundiced complexion. The mist seemed to dull the colour of their clothes, if they had any colour to begin with. I looked past them. Granite cliffs towered high into a dark green sky. “It’s too late for that,” said the taller girl. “This is Hopeless,” the tall girl smiled. “Where’s ‘here’?” I asked, even though the awful truth dawning on me. Both girls pointed to the top of the cliffs. Through the swirling mist I could see it. A huge metal sculpture arcing into the sky. Except, I knew it wasn’t a sculpture. The shape was the same and the engraving was the identical; ‘You shouldn’t have done that’. “That’s impossible,” I croaked as the taller girl started laughing. In the year of 1724, the month of July was unbearably hot. I sometimes wonder if it was the heat that induced a madness in me. Since I arrived on this forsaken island we have washed up on many shores. I have seen bridges span the widest rivers, buildings touching the clouds and dozens of poor, unfortunate souls have become my unwilling companions. I smile now as I think of the time I uncorked the bottle and I thought that was how I ended up here. It wasn’t. With the bottle came a note, written by the tall girl. 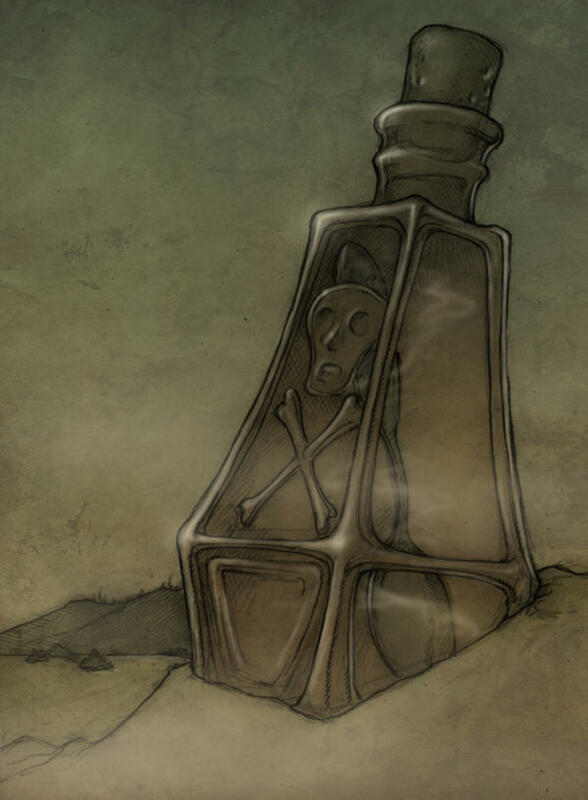 It was the story of how she came to be in the bottle. I didn’t tell you that at the beginning because you may not have read this far. Tell me, what colour is the sky?